Looking for ways to spruce up your bathroom? Need a new look or just need to brighten up your space? Try new bathroom lighting. Plus, the bathroom is a place that needs ample lighting considering that is the place where shaving, makeup application and showering takes place. There are many different options you can have with the lighting of your bathroom. Most bathrooms have vanity lighting. 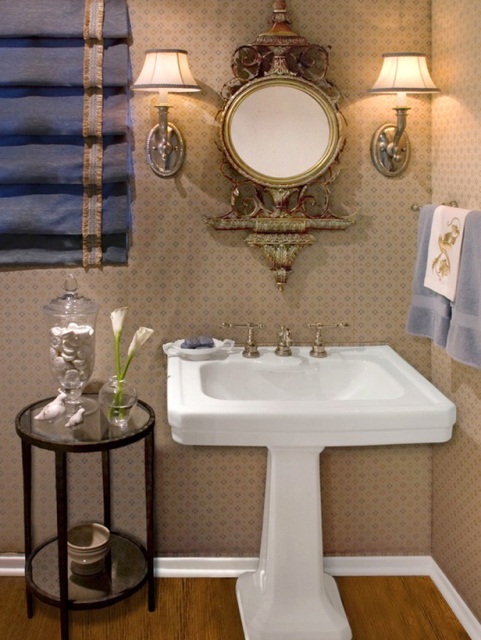 Vanity lighting can come in the medicine cabinet or you can mount sconces or ceiling fixtures. Either way there is so many varieties and styles to choose from. But first, lets start with how you can save money and install your own bathroom lighting. Shut off the power to the bathroom. In your home’s main electrical box shut off power to the bathroom where you will be installing the light fixture. 1. Remove the old light fixture. 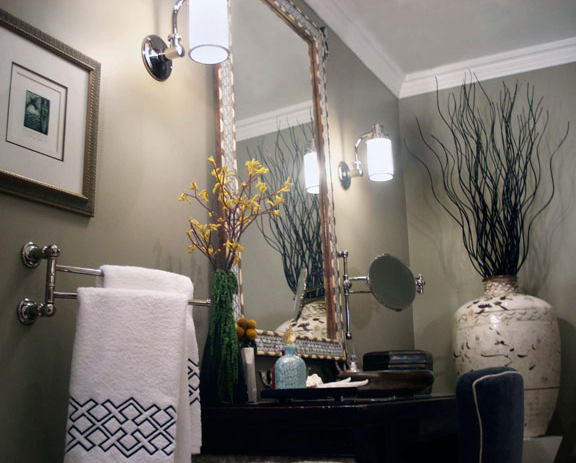 Remove any bulbs and fixtures from the wall and remove the old bathroom light fixture from the wall. Use a circuit tester to test the wiring to ensure it’s safe to disconnect the bath lighting wires. If the circuit tester shows that power is off, disconnect the wiring to remove the original light fixture from the wall. If the test shows that power is on, return to the electrical box to switch off the power. Check that the existing wires are not crimped or tarnished. If they are, use a pair of wire strippers to remove 0.5 inches of wire sheath from the bottom of the wires to expose new wire. Cut off damaged ends with wire cutters. 2. Install the new mounting bracket. Attach the mounting bracket found in the supplies of the new fixture to the electrical box in the wall with a screwdriver and provided screws. The electrical box has designated screw holes on the outside edge where you will attach the new bracket, which is where the original light-fixture mounting bracket was attached prior to removal. 3. Attach the new light fixture wires and mount the light fixture. The new light fixture will have two colors of wiring that should match the wires in your wall. Attach like-colored wires from the light fixture to the wires in the wall. Secure and protect the wire connections with a wire nut, and then place the wires into the electrical box in the wall. Attach the new light fixture to the mounting bracket and make sure it is firmly secured. 4. Add the finishing touches. Attach the proper wattage light bulbs for the fixture and any glass coverings that go with the fixture. 5. Restore power. Now you can turn the power back on for the bathroom and test your new bathroom lighting. Always use extreme caution when working around electricity. If you see sparks or smell something burning when you turn on a new light fixture, shut off the power to that area immediately and contact a professional electrician for service. 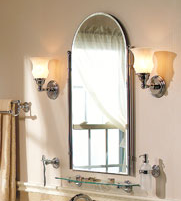 Don’t forget to check out Plumbtile’s variety of bathroom lighting for your bathroom!